Racial stereotypes don't die; they don't even fade away. Though Asian Americans today have "achieved" model minority status in the eyes of the white majority in America by "pulling ourselves up by our bootstraps" through our supposedly quiet, dignified demeanor and gritty, "overachieving" work ethic, the terms of the racial discrimination we face remain the same today as they have since the first Asians began settling en masse in the United States more than a century and a half ago. At the root of this discrimination is the idea of a "Yellow Peril," which, in the words of John Dower is "the core imagery of apes, lesser men, primitives, children, madmen, and beings who possessed special powers" amidst a fear of invasion from the sleeping giant of Asia. Since its inception in the late 19th century, the idea of the Yellow Peril has colored the discourse regarding Asian Americans and has changed back and forth from overt, "racist hate," to endearing terms of what Frank Chin describes as "racist love." In times of war, competition or economic strife, Asian Americans are the evil enemy; in times of ease, Asian Americans are the model minority able to assimilate into American society. What remains the same is that the discrimination, whether overt or not, is always there. The Yellow Peril first became a major issue in the United States in California in the 1870s when white working-class laborers, fearful of losing their jobs amidst an economic decline, discriminated against the "filthy yellow hordes" from Asia, leading to the national Chinese Exclusion Act of 1882 which not only prohibited immigration from China but forbade legal residents from becoming citizens. According to the famed orator of the time, Horace Greeley, "The Chinese are uncivilized, unclean, and filthy beyond all conception without any of the higher domestic or social relations; lustful and sensual in their dispositions; every female is a prostitute of the basest order." This idea of an "Asian menace" was later applied to the Japanese, particularly after Japan's victory over a Western power, Russia, in the Russo-Japanese War of 1904-5 after it had faced more than a half-century of Western imperialism. According to John Dower, "the vision of the menace from the East was always more racial rather than national. It derived not from concern with any one country or people in particular, but from a vague and ominous sense of the vast, faceless, nameless yellow horde: the rising tide, indeed, of color." This feeling of impending doom from the East led to the 1917 Immigration Restriction Act and the National Origins Act of 1924-two acts that prevented nearly all Asian immigrants from legally entering the United States and prohibited immigrants already in the United States from attaining citizenship. The height of a fear of the Yellow Peril happened immediately after Japan's attack on Pearl Harbor on December 7th, 1941, leading the United States to enter into the Pacific War. Popular imagery of the time, particularly through political cartoons (some done even by our beloved Dr. Seuss) debased the Japanese as subhuman apes and gorillas, treacherous in nature and though morally corrupt and mentally and physically lesser to the Americans, possessing in superhuman endurance, strength, sheer overwhelming numbers and mystical powers. This viewpoint of the Japanese as subhuman and treacherous not only led to a race war with Japan, allowing atrocities such as the dropping of the atomic bomb on Hiroshima and Nagasaki to happen, but also fueled the movement towards herding Japanese Americans into internment camps with Executive Order 9066, issued on February 19th, 1942. Virtually all Japanese are short. Japanese are likely to be stockier and broader-hipped than short Chinese. Japanese are seldom fat; they often dry up and grow lean as they age. Although both have the typical epicanthic fold of the upper eyelid, Japanese eyes are usually set closer together. The Chinese expression is likely to be more placid, kindly, open; the Japanese more positive, dogmatic, arrogant. Japanese are hesitant, nervous in conversation, laugh out loud at the wrong time. After World War II, however, the coming of the Cold War marked by the fall of China to Mao Tse-dong in 1949 and the breakout of the Korean War in 1950 made the Chinese and Chinese Americans enemies to American society while making Japanese and Japanese Americans allies and friends, respectively. The same stereotypes applied; what changed was that similar to World War II, the international situation caused them to be applied to different groups. With the American occupation in Japan, the Japanese were now the good, subservient pupils that could learn from the wise, brotherly whites of America. The Chinese and Chinese Americans were now the evil, treacherous, indigent communists that were ready to strike and destroy the fabric of American society. The times had changed but the stereotypes did not. Even today, after immigration restricts have been lifted and almost forty years since the publication of William Petersen's article in The New York Times, "Success Story, Japanese-American Style," and of "Success Story of One Minority Group in U.S." in U.S. News an World Report in 1966 that coined Asian Americans as a model minority-a hardworking, intelligent and obedient minority that has made full use of the "American dream"-the racial stereotypes and the discrimination we face remain the same as they did throughout our history in the United States. Some of the very reasons that originally led to the discrimination against Asians in the past-namely the idea that Asians who were willing to work hard and for low wages would steal jobs from working class white Americans-now became reasons for praise. Yet no matter what, we are still seen as foreigners and not completely American. The more vicious forms of racism are simply waiting in the wings to spring up in times of competition and crisis. As Dower writes regarding U.S.-Japan racial relations, "That vicious racial stereotypes were transformed, however, does not mean that they were dispelled. They remain latent, capable of being revised by both sides in times of crisis and tension." In the 1980s, racism against Asian Americans erupted when the threat of Japanese economic imperialism played into the psyche of Americas-particularly after Japanese interests bought landmarks such as Pebble Beach and Rockefeller Center. The 1982 murder of Vincent Chin by two unemployed auto workers in Detroit who had thought he was Japanese and blamed him for losing their jobs is the most salient example of the racist hate during this time. In 2001, the U.S.-China spy plane incident led some conservatives to argue for Chinese internment and on a more personal level, induced my father to tell me to avoid the rural areas of New Hampshire and to emphasize to people that I was Taiwanese and not a communist. As Frank Chin writes, "conflict with Asia makes Asian Americans vulnerable, because there has been a history of anti-Asian moods leading to anti-Asian American actions. If ordinary people were to act out their aggressions toward Asia, they would hurt not Asians but Asian Americans. They cannot reach Asia, but they can easily hit Asian Americans." Indeed, the Yellow Peril remains alive and well today. It is sobering and somewhat scary for me that racial discrimination at its most basic level has not changed from the hysteria of the Yellow Peril that first began in the United States almost a century and a half ago. The idea that Asian Americans continue to face discrimination despite our "achievements" and are still susceptible to outright racist hate in times of competition and crisis in America is significant because it shows that however much American society has become more racially inclusive, in many ways, it remains the same closed society that our grandparents' generation faced. Laws barring discrimination are not enough; peoples' values still have to change. 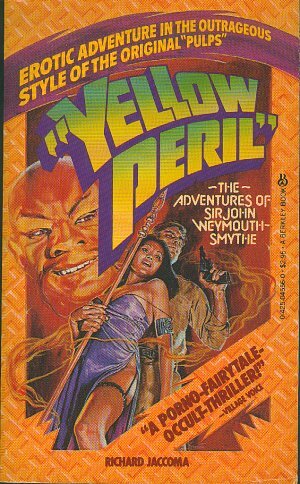 The idea of racial stereotypes and hatred persisting from the Yellow Peril is shocking because I have always believed that I would be able to fit into American society. But after reading John Dower's War Without Mercy, after experiencing racist hate for the first time during the U.S.-China spy plane incident, and after attending the first few weeks of this Asian American History class, I am having doubts about my identity and I am questioning my beliefs. I doubt myself because I am a product of the "racist love," that Frank Chin talks about-I am basically the definition of a "model minority." I recognize how the way in which I have lived my life has simply played into the hands of white America. I definitely see how I am a banana-yellow on the outside and white on the inside-and it makes me ashamed. As a second generation Asian American born in the United States, I grew up in an all-white suburb and have attended some of the most elite educational institutions in the United States-Phillips Exeter and now Dartmouth. As a result, my lifestyle and viewpoints have been those of white, suburban, northeast America: my friends have mostly always been white, I have almost always dated white girls and my heroes growing up were two white hockey players, Mark Messier and Brian Leetch. Though I have undoubtedly been made fun of and have felt out of place for being Asian, I have always believed that I would be able to fit in. Even though I heard the usual epithets of "gook" and "chink," I largely ignored them and tried to prove myself through my accomplishments. After all, if I could beat them on the ice rink, on the track, or in the classroom, I had nothing to be ashamed about. I never really questioned issues of race until I came to college. I have always been the respectable, well-mannered boy that parents (even white parents) simply adore. I am a product of white, suburban America and I have played my role as member of the model minority to a T.
Growing up, I simply had no idea how this model minority myth sprouted from the vicious stereotypes of Asians that has persisted in America and I truly believed that as long as I worked hard and acted responsibly, I could achieve anything that I wanted. I didn't believe in glass ceilings and I didn't believe that people could actually hate me only for my skin color and that I could be seen as a traitor in my own country. Now I do. The arguments that Dower and Wu make are too well-grounded for me to dispute. It is scary thinking how I have benefited from stereotypes that had, in previous generations and in slightly different forms, barred my race from entering the United States and led to almost incomprehensible atrocities during World War II and now, as Vijay Prashad and Frank Wu argue, are being used to keep African Americans down. It is scary but race always is an issue and I was simply naïve for thinking anything different. Chin, Frank and Chan, Jeffrey Paul. "Racist Love." In Richard Kostelanetz, Ed. Seeing Through Shuck. New York: Ballantine Books, 1972. Minear, Richard. Dr. Seuss Goes to War: The World War II Editorial Cartoons of Theodore Seuss Geisel. New York: New Press, 1999. Petersen, William. "Success Story, Japanese-American Style." The New York Times. January 9, 1966. "Success Story of One Minority Group in U.S." U.S. News and World Report. December 26, 1966. Zia, Helen. Asian American Dreams: The Emergence of an American People. New York: Farrar, Straus and Giroux, 2000.